As we dream about the changes we'll make to our new house, we also have to get our current home ready to be an income property. 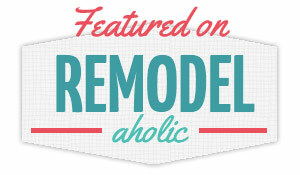 The husband has a list of projects and fixes he wants to make before our tenants move in, so we're going to tackle those over the neck couple of weeks. First up on the list? Giving the fence a facelift so it looks fresh for the new occupants! Scott built this fence all by himself right after we bought this house, and it was A LOT of work. When you invest so much time and energy into something, you want to take care of it so you can make sure it lasts. 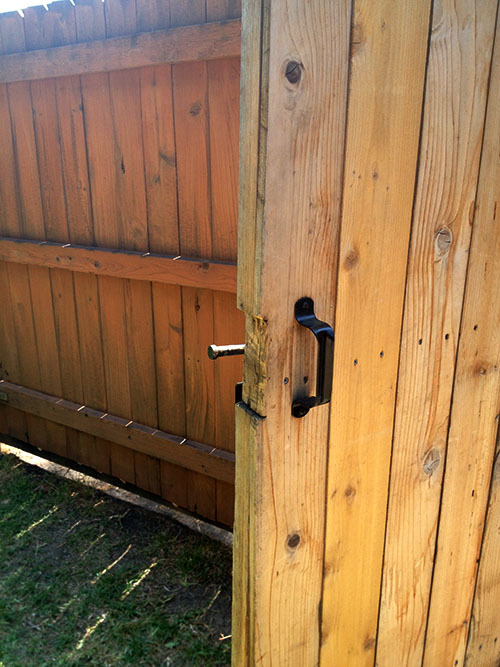 One of the ways to take care of a cedar fence is to regularly apply a "wood protector" product called a waterproofer that protects the fence from water, UV rays and other elements. It's an annoying job, but you have to do it if you want your fence to hold up. 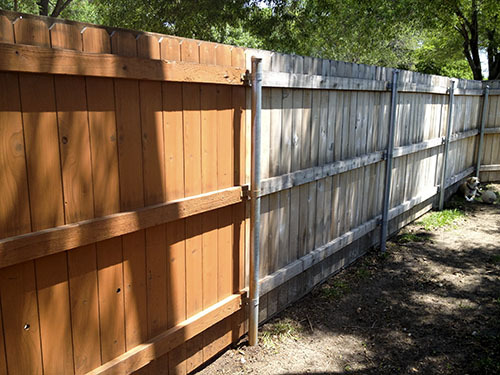 Replacing fences is very expensive, so we should all be motivated to properly maintain them! Our fence has been through some crazy weather (remember these raquetball sized hail stones? ), so it needed to be freshened up. We chose a tinted waterproofer, Thompson's WaterSeal Natural Cedar Wood Protector, since our fence was starting to turn gray, but you can also apply a clear version if you prefer the color of your wood as-is.We bought two five-gallon buckets for the fence and had about two gallons left over. The last time Scott sealed the fence, he did it by himself. The process was tedious and frustrating because some of the color came out unevenly. This time we decided to try a two-person method to avoid those problems. We also added an ounce of linseed oil per gallon of sealant because we heard that would make the stain hold up longer and be more durable. Time will tell on that one! We put the waterproofer in a pump sprayer and used that to apply the sealant. (We had a one-gallon sprayer but would recommend a 2-gallon one to make it more efficient.) Scott sprayed it onto the fence while I followed behind with a large paintbrush, evening out the application and making sure we didn't miss any spots. It didn't take long for my right arm to become dead weight, let me tell you! With both of us working at a fast pace, the fence was completely waterproofed in about three hours. It would have been less if we had a bigger sprayer and didn't have to stop so often to refill the paint. Next time we'll invest in a bigger pump sprayer to save ourselves some time. All in all, the project cost us about $175 in materials (10 gallons of Thompson's water protector, a pump sprayer, some linseed oil and a big paintbrush), but we feel like we got a lot of bang for our buck. It looks like a brand new fence! The new color is really rich and makes the fence look much more expensive, in my opinion. I'd compare the process to dyeing your hair. It's a little shocking when you see the different color for the first time, but then you realize how much better it looks than what you had before. In the end, it was totally worth the time and effort. Hopefully going through this process once every two years helps us keep this fence in great shape for a long, long time!